As soon as I heard about Ginger Otis’s book Firefight, I knew I would have to read it. . . . this is one of those stories of systemic racism that has gone largely unnoticed, and it’s important that we hear it. Plus, Ginger is pretty rockin’ so . . . Enjoy the interview. Firefight: The Century-Long Battle to Integrate New York’s Bravest (St. Martin’s Press, June 2015) was born out of 10 years of reporting. My first assignment to cover the New York City Fire Department came shortly after 9/11, and of course it was an honor to write about the FDNY. As I began to learn my way into the beat, I realized there were thousands and thousands of stories to tell. But one thing jumped out at me: the FDNY was a bit of an anomaly in the city in that it was almost entirely staffed by white men. In fact, that made it a total outlier in terms of diversity. In NYC, which was then 26% African-American, there were only 300 or so black firefighters out of a force of nearly 11,000. It was less than 3 percent — far less than every other city agency. A group of black activist firefighters, known as the Vulcan Society, began to agitate for more inclusion and things escalated into a federal class action lawsuit brought by the federal Dept. of Justice against the city and the FDNY. It was a divisive story that tended to split along racial lines inside the firehouses — but when I dug into it, I realized there was a lot more to be told. It was a story that could be traced to the earliest origins of the civil service hiring system and yet was relevant today. My challenge as a reporter and writer was to take this highly emotional and controversial topic and bring out the human aspect of it. I thought that if I could make the firefighters — all of them — come alive they way that they were to me, then my readers would enjoy this fast-paced and vivid dive into America’s ongoing struggle to achieve true economic justice. 2. What do you do when you’re not writing? Unfortunately, since I’m a reporter, I’m almost never NOT writing! It can be exhausting, and very hard to churn up the energy and enthusiasm to do MORE writing when it’s time to do a book. 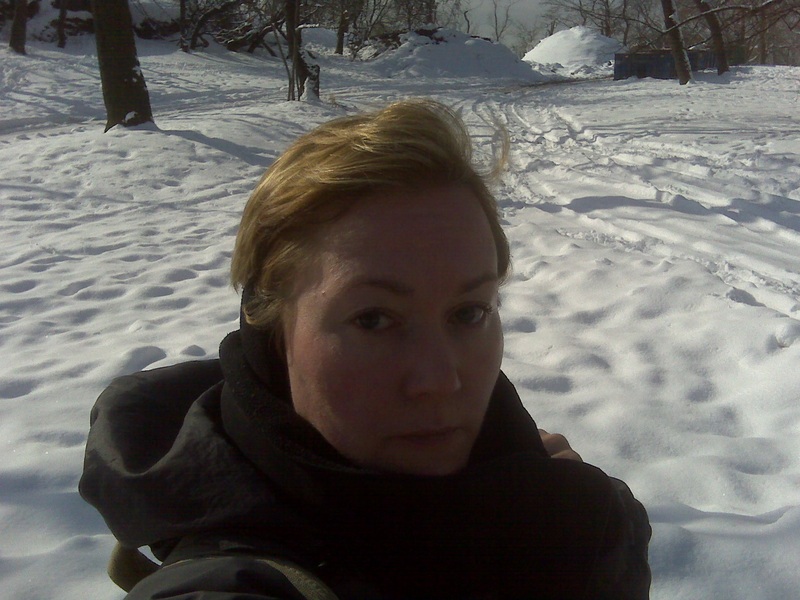 The things that get me recharged are pretty simple — I like to ski, take long walks in Central Park, maybe do some gardening in our community garden or pour myself a glass of wine and talk on the phone to my friends in other cities. 3. How do you balance what will sell with what you want to say? This is a very good question, and one I grappled with a lot when I was trying to get my book sold and find an agent. Publishing, for very legitimate reasons, has to focus on what it can sell, and that means agents and editors are focused on what they think they can market. I got a lot of rejections because people didn’t know how to market Firefight. It wasn’t the quintessential “firefighters are heroes” book. The feedback actually helped me though because the response about the writing and reporting was very positive, so I figured I would just have to find the one agent who DID see its potential and then that agent would find the publisher who DID know how to market it. And that’s what happened. 4. What is your favorite part about being a writer? I am lucky that I wrote about a topic that’s very much alive in many cities across America today, and when I go do book signings and panel talks around Firefight, I am able to bring real firefighters with me. 5. What is your least favorite part about being a writer? The physical aspect of it — it hurts to chain yourself to a desk for hours at a time! And to make deadlines you often have to cut yourself off from your family and friends, really disassociate from life. It’s not fun at all! 6. When you write, who do you imagine as your reader? I think about my readers all the time,but less about who they are than how they will read Firefight. My story is complicated structurally because it weaves back and forth in time, revealing the story of NYC’s earliest black firefighters within the story of the modern black firefighters — and I worried all the time that my readers, whoever they may be, wouldn’t be able to follow the thread. I paid a lot of attention to my structure and the narrative arcs (because I had many real-life characters to incorporate) because there is nothing more important than caring about your readers. If they can’t follow you seamlessly into your world, then you have to go back and smooth out the cracks that trip them up. 7. What are a few of your favorite books of all time? 8. What’s the best writing advice you ever received? 9. What’s your philosophy and practice about reading reviews of your work? Ginger Adams Otis is a reporter at the NY Daily News and has been covering New York City for more than 10 years. 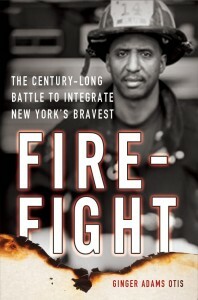 Firefight: The Century-Long Battle to Integrate New York’s Bravest is her first non-fiction book. It’s available in all major bookstores and online at Amazon and Barnes & Noble. Links to reviews and other interviews here: www.gingeradamsotis.com.